Spring Cleaning Can Make Your Beverages Better Year-Round - LOGIC, Inc. I have often wondered what is behind the term “spring cleaning.” It turns out the concept dates back to Bronze Age times when people would clean their homes after a long, hard winter. In northern climes, it was usually done in March or April when the weather was warm enough to open doors or windows yet still cool enough that insects weren’t yet a problem. Of course, after the brutal winter we just experienced on the East Coast, I can understand a general malaise preventing anyone from feeling much like cleaning. But if spring is truly the time to clean, then let’s talk about cleaning! I have to admit that I do know something about the subject (although Sharon, my wife, might be hesitant to agree). We all know that there are times that you can be a little lax when it comes to sanitation, and there are times that it is vital. If you are drawing a growler from a keg to share later that evening, a rinse with water is probably sufficient, but if you are setting up culture plates to streak out your yeast, then you need to sanitize (sterilize if possible) everything, turn off the fans, and hold your breath. Those latter times are something people in the industry refer to as “critical control points” (CCP) and if you want to clean smart, start off by recognizing your critical points. If any piece of your brewing or winemaking equipment touches your end product, it has to be cleaned and sanitized to avoid contaminations that could ruin the taste. In our case, a CCP is any time that beer or wine comes into contact with a surface that might contaminate it, and that particularly happens during transfers. The first thing to consider is the state of your hoses. Examine them and if they are cloudy, hazy, or stained, it’s a good idea to simply replace them. Hoses are cheap — cheaper than what you have spent in time and money on making your favorite beverage so don’t be shy about getting new hoses when you see signs of wear or damage. Glass fermenters can become scaled or etched, and both show up as hazy/cloudy places or lines. If you have scale — meaning it is dissolved by acid you can test it by simply putting some vinegar on the area and letting it dry — then it can be removed with any acid that you find in your supply store. Fill the fermenter and let it soak overnight. But if that isn’t removed with acid, you probably have an etched section and the fermenter should be replace because 1) bacteria will find it easier to survive your sanitation process in that etched area and 2) etching will degrade the strength of the glass and you don’t want it to fail while full. Or while carrying it. Plastic fermenters are harder to check visually, so use preventative methods by never using a stiff brush or abrasive pad. Free caustic can also damage plastic fermenters, so don’t use anything with “hydroxide” in the name on your plastic, lye, or chlorine bleach. Smell your fermenter while you’re looking for obvious damage and if you notice an aroma, remember that some of the smaller and less polar compounds that occur during fermentation can permeate the plastic. A good solution for this is to soak the fermenter overnight with an oxidizer (One Step, anyone?). In really hard water areas, you can get scale in plastic, too. That’s easy to see because the shiny surface stops being shiny when there is scale present. If you are lucky enough to have a stainless fermenter, I bet that you break it down every time you clean it. If you don’t, you should. But do you also break down your serving kegs? I admit that I do it only about once a year (although not necessarily in the spring). Cleaning-in-place by circulating the cleaning solution and soaking, followed by sanitizing is often fine for kegs, especially if they are stored in the fridge when full, but there is still going to be a buildup over time and breaking them down is the only way to take care of that. 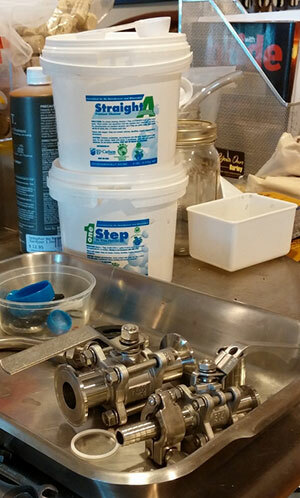 If you don’t break your taps down, either, well … now that you have the tools out you might as well take care of them. So now that you’ve done your spring cleaning, it’s time to make something. Feel free to send me samples so I can evaluate your cleaning efforts. And also feel free to email me with questions about cleaning, too.